�The theory of evolution (is) a theory universally accepted not because it can be proved by logically coherent evidence to be true but because the only alternative, special creation, is clearly incredible.� (D.M.S. Watson, �Adaptation,� Nature, Vol. 123 [sic Vol. 124] (1929), p. 233). This section of Christian Resources for New Believers focuses on the lies that are presented as fact in the science textbooks in our schools. This section is not intended to be a comprehensive overview of the debate between evolutionary theory and creationism. There are many web sites already devoted to the subject of creationism. Links to those sites are available at the end of this page. I want to state up front that I am not opposed to science. I love science. I also believe that we have many wonderful teachers in our public schools. I am not proposing that creationism be promoted in our schools. I simply believe that our schools have a responsibility to teach the truth. I don't believe that our children should be deliberately lied to. Most states have laws that prohibit state agencies and other public entities from using tax dollars to knowingly purchase or distribute material that contains, or represents as factual, information that has been proven fraudulent. I would agree that this is good legislation. However, states do not enforce this legislation. As a result, yout tax dollars are being used to present fraudulent information as fact. This fraudulent information is used to promote a Humanistic worldview, and is therefore, state-funded evangelism for Humanism. The following is brief overview of fraudulent and inaccurate material commonly found in science textbooks from grade school to college. The column is supposed to represent a vertical cross-section through the earth�s crust, with the most recently deposited (therefore youngest) rocks at the surface and the oldest, earliest rocks deposited on the crystalline �basement� rocks at the bottom. If one wishes to check out this standard column (or standard geologic age system), where can he go to see it for himself? There is only one place in all the world to see the standard geologic column. That�s in the textbook! In the real world, there are of course, many layers, but in no place is the entire column represented, and in the majority of places, the layers are in the wrong order. There are some other interesting things to note about the geologic column. Many of its layers, wherever they are found in the world, are sorted with the courser material on the bottom and the finer material on the top of that individual layer (Except in the case of underwater �slumps� where the material is sorted fine to course). Does this sorting make sense to have happened over millions of years? Sorting like this does not take place today except in specific circumstances. This kind of sorting only occurs naturally in water, and specifically in underwater mudslides called turbodites. I think it is interesting that much of the geologic column looks exactly like turboditic layering. Other evidences indicate that the layers were layed down rapidly, underwater rather than slowly over millions of years. 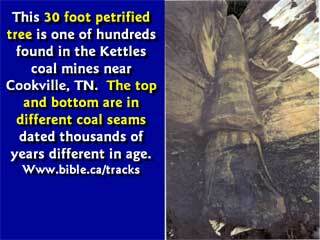 All over the world, trees are found petrified, standing up, running through several "ages". If these layers really represent ages, we must either accept that the tree stood for millions of years, while the layers slowly built up around the tree, or that the tree grew up through millions of years of rock in search of sunlight. In recent history, we had a very powerful demonstration of how layers are formed rapidly through a catastrophe. When Mount St. Helens erupted, it devastated the surrounding area. In this area, many layers of sediment were deposited rapidly, and in many layers. Several canyons were formed by the mud flows, all with features that look remarkably like the Grand Canyon in miniature. Trees were blasted off the face of the mountain, and many of them ended up floating on Spirit lake. Over a short time, as the trees became waterlogged, the began to sink vertically, and become embedded in the mud at the bottom of the lake. The trees here are sinking through many soft layers of material. This process shows a much more likely scenario for the explanation of polystrate tree fossils. One last note on the geologic column: The ages of the rocks in the column are identified by the index fossils they contain. The fossils are dated by the layers of rock they are in. This is circular reasoning. In recent years, scientists have made the claim that the rocks are dated using radiometric dating, but the truth is that the dates of the layers vary wildly, and any dates that do not conform to the geologic column are regarded as "flawed" and not used. For years, graptolites were considered index fossils for the Ordovician period (505 to 440 Million Years Ago). Click Here for more. However, graptolites were discovered alive and well in the south Pacific. 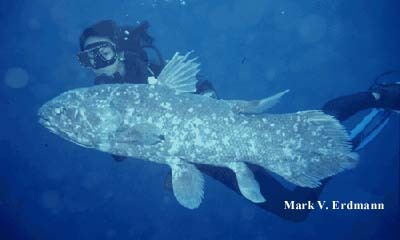 The Coelacanth (Shown in the images to the left) was used to date layers that were 70 million years old, but they are alive and well in the Indian Ocean. Other famous living fossils include the tuatara (supposedly extinct since the Cretaceous Period until found still living in New Zealand), the Lepidocaris crustacean (only found as fossils in Devonian rocks), the Metasequoia conifer tree (thought extinct for the past 20 million years), the Neopilina mollusk (supposedly extinct for 280 million years), the lingula brachiopod ("extinct" since the Ordovician), and even the trilobite (chief index fossil of the even more ancient Cambrian Period). The bottom line is that if these animals are alive today, they cannot possibly be used to prove that the layer of earth they are contained in is any age. Furthermore, the fact that they remain today without any apparent change over the "millions of years" deals a hard blow to the theory of evolution. Our textbooks point out many examples of microevolution, which is really just a slight variation, and claim that this is proof of macroevolution - the change from one kind of animal to another. The truth is, variations exist, but there are limits. Nowhere on earth, or in the fossil record have we ever seen any evidence of one kind of animal giving rise to another. I would agree that the wolf and the dog, and the coyote probably have a common ancestor - a dog. However, you can cross-breed memners of the dog kind for as long as you want, and you will never get anything other than a dog. "The fact is that the evidence was so patchy one hundred years ago that even Darwin himself had increasing doubts as to the validity of his views, and the only aspect of his theory which has received any support over the past century is where it applies to microevolutionary phenomena. His general theory, that all life on earth had originated and evolved by a gradual successive accumulation of fortuitous mutations, is still, as it was in Darwin's time, a highly speculative hypothesis entirely without direct factual support and very far from that self-evident axiom some of its more aggressive advocates would have us believe. "�*Michael Denton, Evolution: A Theory in Crisis (1986), p. 77. 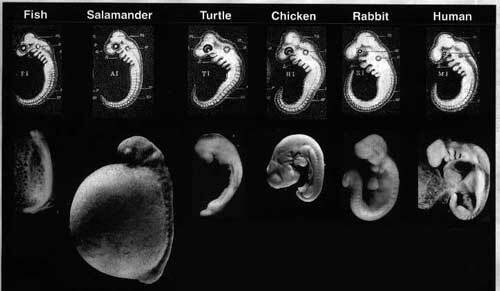 Embryo drawings were used in the 20th century as evidence for the theory of common descent in discussions of biological evolution. They compared embryonal stages of certain vertebrates and vastly overemphasized the similarities. These similarities were claimed to be evidence that humans and fish evolved from a common ancestor. The drawings were originally produced by Haeckel to illustrate his now discredited theory of Ontogeny recapitulates phylogeny. He was later convicted of academic fraud, but the drawings found their way into biology textbooks nevertheless. These pictures are still in textbooks today as evidence of evolution., even though they were found to be fraudulent in the 1850�s. In 2000, Harvard professor Stephen Jay Gould called the continued use of these "fraudulent" embryo drawings the academic equivalent of murder. "We do, I think, have the right," he wrote, "to be both astonished and ashamed by the century of mindless recycling that has led to the persistence of these drawings in a large number, if not a majority, of modern textbooks." You can hardly attend high school or college now days with out hearing or reading this "whopper". In fact, neither gills nor their slits are found at any stage in the embryological development of any mammal including man. The folds in the neck region of the mammalian embryo, that are erroneously called "gills", are not gills in any sense of the word and never have anything to do with breathing. They are merely flexion folds, or wrinkles, in the neck region resulting from the sharply down turned head and protruding heart of the developing embryo. These folds eventually develop into a portion of the face, inner ear, tonsils, parathyroid and thymus. No reputable medical embryology text claims that there are "gill slits" in mammals. Still, the gill slit myth is perpetuated in many high school and college biology text books as "scientific evidence" for evolution. Even Dr. Spock in his book 'Baby and Child Care' claims that "as the baby lies in the amniotic fluid of the womb, he has gills like a fish." Perhaps the "gill slit" myth continues to be taught because there is no better "evidence" for evolution. How many of you were taught the gill slit myth in school?? Dr. G.S. McLean: "The chart is assembled from fossils found in India, South America, North America and Europe, then arranged in a neat sequential order of size, the smallest to the largest. There is no proof whatsoever that one member of the chart has evolved into another." "Darwin... was embarrassed by the fossil record... we are now about 120-years after Darwin and the knowledge of the fossil record has been greatly expanded. We now have a quarter of a million fossil species but the situation hasn't changed much. The record of evolution is still surprisingly jerky and, ironically, ... some of the classic cases of Darwinian change in the fossil record, such as the evolution of the horse in North America, have had to be discarded or modified as a result of more detailed information." 1. The horse series was constructed from fossils found in many different parts of the world and nowhere does this succession occur in one location. The series is formulated on the assumption of evolutionary progression, and then used to 'prove' evolution! 2. The number of ribs varies within the series, up and down, between 15, 19 and 18. The number of lumbar vertebrae also changes from six to eight and then back to six.